It's a dread that many public speakers have. The interruption that comes from nowhere. Because not many of us know how to handle interruptions. So knowing how to handle an interruption during your speech is certainly a key skill. And it's one that President Bill Clinton appears to still have. He might have been out of the White House for the best part of 16 years but his public speaking skills are as sharp as ever. Once again he's on the campaign trail supporting Hillary Clinton in her bid for the Democratic nomination to run for president in November this year. His first speech of the New Year in New Hampshire appeared a little weak, perhaps rambling...until you considered his role. He's playing the supporting role. So, he's not meant to be the centre of attention. Once we had that on board his downbeat style and slightly deliberate delivery made much more sense. President Clinton was speaking in Cedar Rapids, Iowa when he was interrupted by his own phone that rang loudly. Bill Clinton was speaking on the subject of a rising epidemic of heroin and opiate addictions in the USA when his phone started to ring. Recovering quickly, he removed his phone from his pocket and presumably, pressed ignore. I'll have to call Hillary back and explain why I couldn’t take it. Style and aplomb. Very skilfully done, Mr President. 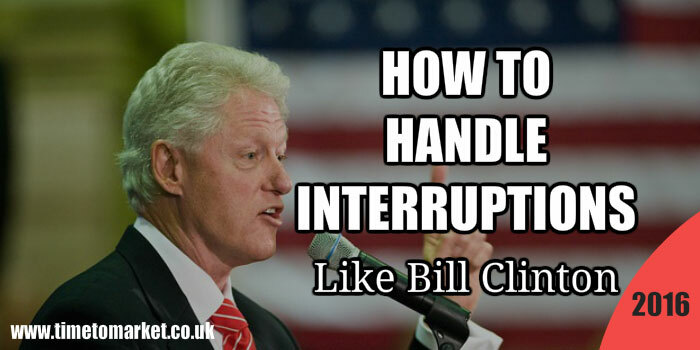 "I’ll have to call Hillary back and explain why I couldn’t take it"
For more prosaic tips on how you can handle an interruption during your speech or presentation there's more here: dealing with interruptions. Or, you can always consider a one to one coaching session that gives you the skills and confidence to handle interruptions and succeed with your next speech.